This name derives from the Hebrew "Yàdad > Dâvid / Dâvı̂yd > Dāwīḏ”, meaning “beloved, loved by God”. David according to the Hebrew Bible, was the second king of the United Kingdom of Israel, and according to the New Testament Gospels of Matthew and Luke, an ancestor of Jesus. 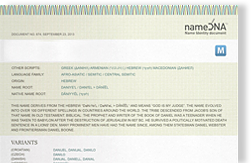 David is central to Jewish, Christian, and Islamic doctrine and culture. Biblical tradition maintains that a direct descendant of David will be the Messiah, and in Islam, he is considered to be a prophet. Saint David (Welsh: Dewi Sant; ~500–589) was a Welsh bishop of Menevia during the 6th century; he was later regarded as a saint and as the patron saint of Wales. David was a native of Wales, and a relatively large amount of information is known about his life. However, his birth date is still uncertain, as suggestions range from 462 to 512.